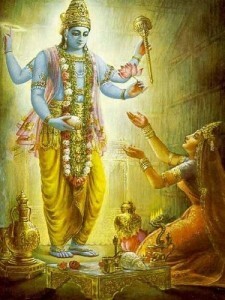 kOkanagai kELvan adiyArkky avan adiyE Agum — feet of the husband of pirAtti and becoming HIS devotees and get the svarUpam of being treated as one, with no differences. In the last pAsuram, svAmi aruLALa perumAL emberumAnAr told “evvuyirkkum indhirai kOn thannadiyE kANum saraN”. In this pAsuram, he gives an example to bolster that thought that it is sriman nArAyANan’s lotus feet that is the refuge for everyone one and the like. The devotees of sriman nArAyANan are called as “thirumagaL maNALanukku adiyAr” (devotees of perumAL who is the husband of pirAtti). These devotees before realizing their true svarUpam, have some kind of identification that includes a name in conjunction with their associated town, a name that is in conjunction with their associated varNam and many such associations. However, after they realize their true svarUpam (through the causeless cause of the divine couple and AchAryan), there is no identification of those town,varNam or whatsoever anymore. Their only identification that they have is sriman nArAyANan’s lotus feet and nothing else. In these three, we can note that the authors have mentioned about one’s place of birth (kudi), varNam (kulam), gOthram and other birth identifications (ellAm). kOkanagaik kELvan adiyArkku: “kOkanakam” refers to lotus and so “kOkanagai” refers to the one who is seated atop a lotus. Thus it refers to pirAtti. “kELvan” refers to a hero and so the phrase “kOkanagaik kELvan” points to “sriman nArAyANan” who is the hero of pirAtti (sri mAhAlakshmi). The word “adiyAr” refers to those devotees who are under the lotus feet of such a perumAL who is the hero of pirAtti. This act of being under THEIR lotus feet itself is the identification for them. avan adiyE Agum – This means that these aforementioned devotees who have been identified with their place of birth, varNam, gOthram etc, they would no longer be associated with any of their earlier identifications once they become a devotee of sriman nArAyANan. All those earlier identifications get destroyed and the only identification that stands out for them from that moment on is that they are devotees of sriman nArAyANan. Their relationship with sriman nArAyANan’s lotus feet establishes an identification for them. This is why they are being called as “thirumAl adiyAr”. svAmi aruLALa perumAL emberumAnAr explains this with an example in the second half of the pAsuram. nIr kezhuvumARugaLin pErum niRamum ellAm: Rivers have lot of water in them. Rivers have different names for them like Ganges, Yamuna etc and come in many colors as well like red, black, white etc. Conclusion: One’s earlier, historic identifications gets destroyed when one becomes a devotee. This destruction is similar to the destruction that individual rivers encounters upon mixing up in the ocean. Rivers lose their name, color etc. Hence, we should not give any importance to all those temporal and impermanent factors like varNam etc but should focus only on the only permanent thing that is called as “adiyarAm thanmai”. This is nothing but being a servant (devotee) of perumAL and pirAtti forever. This quality of being a servant of perumAL and pirAtti is not just for one or two selected souls. Instead it is for all souls one and the like. This would remove all differences arising out of temporal factors and unite all souls under one common umbrella known as “thirumAl adiyAr”.